Religious intolerance is getting worse here, with state agencies, radical groups and community organizations involved in violations of freedom of faith and religion, according to a report released Tuesday. The recent sealing of the synagogue in Surabaya, East Java, by Muslims in a protest against the Israeli attacks on the Gaza Strip was the latest case of religious intolerance in Indonesia. The incident was not included in the 2008 Report on the Condition of Religious and Faith Freedom in Indonesia, which was released by the Setara Institute for Democracy and Peace. But Setara Institute chairman Hendardi said the closure of the Jewish place of worship was against the principle of religious tolerance. “It is clearly part of religious violence and cannot be tolerated,” he told The Jakarta Post after launching the report. The report found 265 cases of violence against religions from January-December last year, a significant increase from only 135 cases in 2007. “The increase is spurred by the rising persecution against the Jamaah Ahmadiyah by Islamic organizations to pressure the government to issue a presidential decree banning the minority sect,” the report said. Last year, the government issued a joint ministerial decree forbidding Ahmadiyah from spreading its religious teachings, bowing to pressure from extremist groups that had attacked its followers, their mosques and houses across the country. Out of the 265 incidents, the institute recorded 367 violations against freedom of religion and faith. “Of the 367 violations, the state was involved in 188 cases of violence both by ‘commission and omission’,” Hendardi said. The report said police were involved in 121 cases of religious intolerance, regents and mayors in 28 cases while 52 others involved courts and regional legislative councils. “What is worrying is that more individuals and unidentified groups launched sporadic religious attacks, which reached 91 cases last year,” Hendardi said. The report blamed the radical Islamic Defender Front (FPI) and the Indonesian Ulama Council (MUI) as the main actors in the religious violence. “We record the MUI involved in 42 cases and the FPI in 27 cases including in the Monas incident last year,” he said, referring the brutal attack on activists during a pro-tolerance rally in the National Monument, Central Jakarta. The Setara conducted investigations in North Sumatra, South Sumatra, West Sumatra, Jakarta, Banten, West Java, Central Java, Yogyakarta, South Sulawesi, South Kalimantan and West Nusa Tenggara. 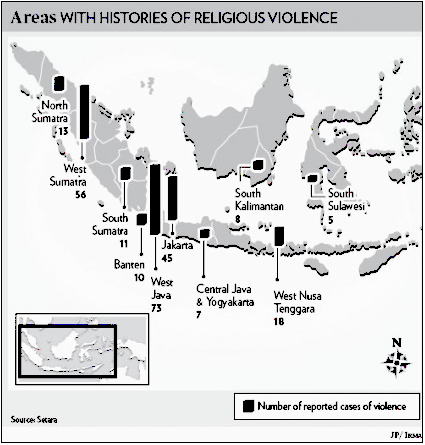 West Java was the province recording the highest rate of religious violence with 73 cases, followed by West Sumatra and Jakarta provinces with 56 and 45 cases, respectively. “Most of the cases took place in June when the government issued a joint ministerial decree to curb the activities of Ahmadiyah,” Hendardi said. Religious Affairs Minister Maftuh Basyuni claimed a 2006 decree on religious harmony had sharply decreased religious violence in the country. “This is big achievement,” he said Tuesday as quoted by Antara. The 2006 decree requires people to obtain government permits to build houses of worship. Earlier, the Wahid Institute said religious violence rose to 232 cases in 2008 from 197 in the previous year.